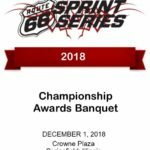 Friends and families of the Route 66 Sprint Series presented by MG Tires and Franklin Motorsports gathered in Springfield, IL this past weekend for the 2017 Champion’s Banquet. Once again, the Crowne Plaza ballroom was the site of the festivities. Approximately 250 guests took part in the celebration, which included a first class dinner, an awards ceremony, and numerous prize drawings. Series announcer, Tim Koyen emceed the event, with Katie Kruger presenting the awards. The first order of business was the recognize the 2017 Series Staff, as well as bid farewell to the staff that are moving on after this year, which include Tech Assistants Tim Andersen, Tony Wyse and Alex Hornsby, Series Administrator Dan Green, Series Assistants Julie Green and Paulette Andersen. Series Tech Director took a moment to thank his Assistant Tim Andersen for his contributions and credited him with a big part of making Route 66 & USPKS the top Tech program in the US. There will be some new faces on staff in 2018, in addition to Tim Koyen already being announced as the new Series Administrator. Following the thanking of the 28 Series Sponsors, a special Grillmaster Award was presented to Robert Bromberek of DR Kart Midwest for the feasts he put on for everyone at the Joliet event. The next award presented was the Chassis of the Year, which went to Benik Kart, who compiled impressive season totals with 22 victories, 16 runner up finishes, and 16 third place results, with a limited number of drivers. Accepting the award on behalf of Benik was Gary Zarbo of SSCKarting/Benik Midwest. 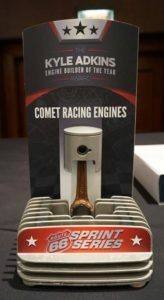 The last special award was the Kyle Adkins Engine Builder of the Year, which was won by Comet Racing Engines. The custom trophy was designed and fabricated by TEK Enterprises, with help from TJ Koyen at Oktane Visual, Brian McHattie of DB Motorsports, and Kevin Nelson of Switch Engines. All of whom donated their services. Mike Adams of New Castle Motorsports Park accepted the award on behalf of Comet and gave a brief but emotional acceptance speech. Following a brief intermission, the drivers awards presentation began. Approximately 70 drivers were on hand to accept awards in 10 classes. 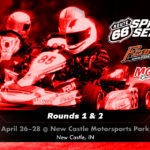 The only double class champion was Garrett Adams, who, in addition to the championship jackets and rings that all the champions received, was also awarded a full season entry to the 2018 United States Pro Kart Series. The other class champions were Ava Hanssen, Alexander Kardashian, Matthew Northrop, Hunter Pruitt, Sarah Bradley, Armin Cavkusic, James Lynch, and Dane Sensel. After all the awards were passed out, prize drawings were held. 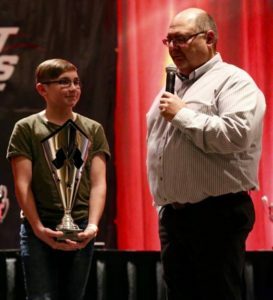 An IAME Micro Swift engine package was drawn for out of the Yamaha Rookie and Cadet drivers, which was won by Cameron Brinkman. An IAME KA100 package was drawn for out of the Yamaha Jr and X30 Jr drivers, and was won by James Lynch. Yamaha Sr and X30 Sr drivers also had a chance at a KA100 package, and that drawing was won by Armin Cavkusic. There were also a number of raffle prizes, which included 2 more chassis, kart stand, a grill, and another IAME engine package. 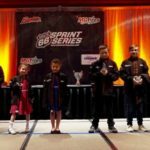 All the drivers also received a prize from the Prize board, and many families also received a family prize from that prize board. Every single Kidkarter in attendance received a hoverboard, courtesy of Mills Pallet. 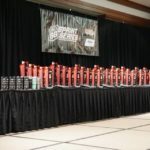 When all was said and done, approximately $50,000 worth of prizes were distributed at the event. The evening was wrapped up with the official release of the 2018 class lineup. IAME KA100 Junior (Ages 12-15) Runs with KA Sr.
IAME KA100 Senior (Ages 15+) Runs with KA Jr.